Although we’ve cut a lot of gluten out of our diets in the last two years, I’ve never been willing to take it further – until now. The hardest part for me is the loss of pasta and bread in particular – mostly because I rely on pasta for comfort and sandwiches for lunch (everyday). We made this salad over the summer to use up some left over brown rice and the mint in the garden, and it was an instant hit. It works well for a gluten free lunch with the addition of chicken. In a heavy-bottomed pan, heat 1 tablespoon of olive oil. Rinse the brown rice well and it it to the hot pot, followed by the chicken stock. Bring to a boil, cover, reduce heat to low, and simmer for 35 minutes. Don’t peak. When it is done, fluff with a fork and allow to cool down a bit uncovered. Meanwhile, mince the shallot and add to the dressing bowl with the vinegar. Measure the olive oil and set aside – you will want to whisk the dressing right before you are ready to pour it on the rice. Then finely dice the chicken breast, chop the olives, crumble the feta, and mince the mint. While the rice cools, whisk the olive oil into the vinegar and shallots slowly so that the dressing comes together. If you doubt your whisking abilities, add it all to a jar and shake vigorously. Add the pepper. Pour the dressing over the warm rice and toss to coat. 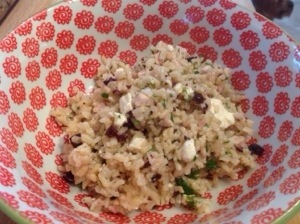 Then add the olives, feta, mint, and chicken – toss to combine. Eat warm or cold – we keep it in the fridge for lunches throughout the week.